One of the most luxurious sweets you can make is the truffle - and there’s no reason why you shouldn’t make a sugar free version. Honey, granulated sweetener and even sugar free jam can be used to sweeten these rich, moist sweets. Whichever you choose, you can combine the sweetening ingredient with all sorts of flavours to add something different to your delicious sweet.Nuts and spices, of course, often work well with chocolate and adults can, of course, can add alcohol to their sugar free truffles. Brandy works beautifully but you can add a tablespoon of any spirit to suit your own tastes. This is a basic sugar free truffle recipe. It makes a very rich sweet that is best enjoyed with a cup of coffee after a meal or with a glass of liqueur.By dusting your truffles with cocoa after rolling them into balls, you can give them an additional bitter chocolate edge while also giving them a very professional looking finish. Place all your ingredients in a small bowl and mix together well. They should come together to make a pasty dough. If your mixture seems a little runny, place the bowl in the fridge for half an hour or so to harden a little. 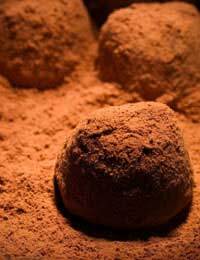 When firm enough, roll into balls then roll in a little more cocoa powder. Place on a baking sheet and leave to harden in the fridge. Serve after a meal or place in a small box as a gift. This adult truffle has a strong brandy flavour. Give it a slightly different finish, using ground nuts if you fancy a change to cocoa. Melt your honey and cocoa in a small pan. Remove from the heat and allow to cool. Add your brandy to the mixture then your cream. Put the pan to one side and leave for at least an hour (if not longer). The mixture should start to set firm. Before it is completely hard, spoon you mixture out, roll into a ball in your hands and then roll in your ground nuts. Place on a plate or tray and leave to harden further in the fridge. The warm ginger edge in these truffles works beautifully with the chocolate. Some people prefer to make these spicy sweets a little smaller than usual as they have a stronger flavour. Place all your ingredients in a small bowl and mix together to make a pasty dough. Roll into balls then roll in a little more cocoa powder. Try making your truffles the size of small marbles. Place on a baking sheet and leave to harden in the fridge.